A typical Filipino home with sawali walls. Image source: TagalogLang.com. 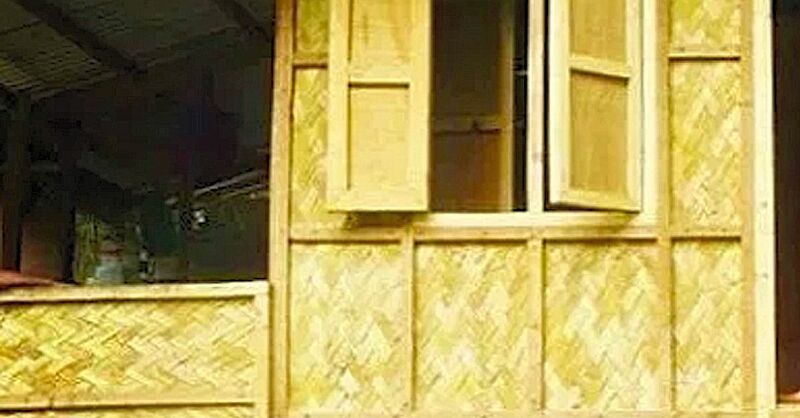 For the benefit of non-Filipinos who may stumble upon this article as well younger readers who may not know in this age of concrete-walled houses, the “sawali” is “a coarse twilled matting of flattened bamboo strips used in the Philippines for partitions, walling and baskets1.” It used to be standard material for building homes in the era of the “bahay kubo” or the Filipino nipa houses. It is likely impossible to establish who first wove the sawali, which was likely being made even in pre-Hispanic times. “The king made us sit down there on a bamboo mat with our feet drawn up like tailors,” wrote Antonio Pigafetta, who had sailed with Ferdinand Magellan to act as his chronicler2. He, however, failed to specify if the mat was woven. However, there is in the so-called “historical data3” of Taal4, Batangas an alleged oral history that was transcribed for the first time about the supposed origin of the sawali-making industry in the barrio of Mahabang Lodlod. The story was set in 1848. It sounds more like local folklore rather than actual history and claims that sawali was previously “unknown in the islands” (i.e. the Philippines) until the sawali-making industry was started in Mahabang Lodlod. As mentioned, the woven material could have been being manufactured before the arrival of the Spaniards, and not just in Batangas. The alleged oral history is present below as it is contained in the “historical data,” edited for grammar here and there to conform to the standards of this web site and annotated where deemed necessary by this writer. A hundred fifty years ago, the so-called sawali was unknown in the (Philippine) islands, and Mahabang Lodlod was still nameless and uninhabited. One day in March 1848 [this date renders “150 years” ago somewhat curious because since the “historical data” was between 1951 and 1954, “150 years ago” should have placed the setting of the story at the turn of the 19th century. ], there were two lovers who eloped and selected Mahabang Lodlod as their temporary residence. This place was about 3 kilometers from the poblacion of Taal overlooking the big San Martin church, the whole town and Balayan Bay. The two lovers, Guillermo and Anita, had lived in the place for only a few days and yet they were content and happy. They spent many days and nights under the trees. The cold December came and the beast of the easterly wind, “amihan,” carried with it the cool breeze from southeastern Asia. [This is erroneous. “Easterlies” are warm winds that come from the Pacific Ocean. What the author meant was “northeasterlies” or winds that come from northeastern Asia.] They then felt the need for a house. Guillermo began to cut bamboos, which were plentiful in the locality; and a few weeks after, Anita found out that the only part missing were the walls. For these, Guillermo gathered palm leaves which were common in those days. The hut of Guillermo and Anita, the first dwelling in Mahabang Lodlod, after many years protruded to one side. The palm leaf walls were the first to fall to the ground. Guillermo had a strong desire to replace the fallen walls with some durable materials. He was thinking day and night of what to use which will not only be durable but also more beautiful than palm leaves. One day, Guillermo caught sight of a mat in a corner of the hut. He thought he could make something like it out of bamboo splits. He began to split a bamboo two meters long and began to weave using the mat as a model and guide. It was quite difficult to weave for the splits were thicker than palm leaves. Anita, who was watching him as he worked, upon seeing the finished product, realized that it could be used as their wall. After weaving several pieces, the lovers put the woven bamboo splits in place. They found it comfortable and more attractive than the palm leaves. They agreed to call their wall “sawali” and as to what they meant by calling it so, no records show. People of the neighborhood, upon seeing the walls of the lovers [i.e. their house] began to ask how he [Guillermo] made them; and soon, the walls of the houses in that barrio were all of sawali. As the years passed, there was a demand for sawali from the neighboring barrios and even those Taaleños who migrated to neighboring towns used it for the walls which forced the people of Mahabang Lodlod to make sawali-weaving as their chief industry. One hundred and ten houses and three hundred fifty persons are wholly dependent on the industry for their livelihood. They begin their work early in the morning using kerosene lamps when it is still dark until late in the evening. The weaving is done mostly during the nights. A fast worker can make four or five pieces of sawali two by two meters in a day. Each piece, which contains four square meters, costs two pesos. A fast worker after deducting the cost of the material earns at least five pesos a day. 1 “Definition of sawali,” online at MAntonio Pigafettarriam-Webster. 2 “First Voyage Around the World,” by Antonio Pigafetta, Volume 33 of the “Philippine Islands” series by Emma Helen Blair and James Alexander Robertson. 3 “Historical data” were documents required by the administration of then-President Elpidio Quirino in 1951 of Department of Education districts around the Philippines to reconstruct local histories that might have been destroyed during World War II. 4 “Historical Data of Taal,” online at the National Library of the Philippines Digital Collections. 5 “History and Cultural Life of the Barrio of Malalim na Lodlod,” online at the National Library of the Philippines Digital Collections.